Visitors to Washington, D.C. looking for fun outside the monuments and museums circuit should consider a day trip to Busch Gardens, located in Williamsburg, Virginia, a two-hour drive south. The amusement park is best known for its huge roller coasters, including the Griffon, the world’s tallest dive coaster, thrilling riders with a stomach-churning, 90-degree downward drop. Other coasters include Tempesto, and perpetual favorite Loch Ness Monster, known for its interlocking double loops. In one day at the park, you can hit them all. Busch Gardens caters to non-adrenaline junkies as well: Ride the skyride, take a river cruise, or watch one of the park’s many shows. Sesame Street characters can be found in the Forest of Fun, and the park’s Oktoberfest runs all summer. You’ll also see troupes of dancers and acrobats scattered among the park’s six European-themed sections, recreating the feel of England, Scotland, Ireland, France, Germany, and Italy. You can take your own European tour by steam-powered train. Buy discount tickets online in advance here, and print them at home to avoid the lines at the gate. 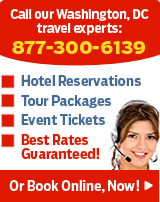 For vacation packages, hotels, tickets, and more, see our Busch Gardens Vacations page. For more park information, visit www.buschgardens.com. Hours: Park hours vary with the seasons. In the summer, Busch Gardens is open most days from 10 a.m. to 9 p.m., though some days it stays open as late as 11 p.m. In September and October, the park closes most days at 6 or 7 p.m., and is usually only open Friday through Sunday. It is closed through most of November and then open weekends from Thanksgiving through Christmas from 4 p.m. to 9 p.m. In short, check www.buschgardens.com before you go. Admission: $75 for adults and children over 10, $65 for children between 3 and 9, and free for children under 2. Or buy them online here for a discount. Parking: Parking is provided directly in front of the main entrance for guests with a valid parking permit. Metrorail: There is no public transportation to the park. Drive south on I-95 to Richmond, then take I-295 south to I-64, and follow I-64 east to Exit 243A.